Welcome to This Week at St. Paul’s. 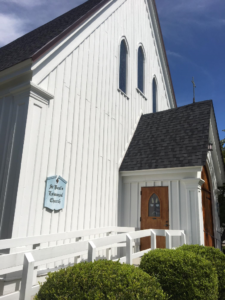 This is a weekly and occasional email from St. Paul’s Church with announcements pertaining to the life and ministry of this parish. These are the opening sentences of the Easter Vigil, the most sacred service of the liturgical year, rivaled only by the Feast of the Incarnation. If you have not experienced a vigil, prepare yourself for a moving experience. This is not to be confused with a vigil of prayer kept from the close of the Maundy Thursday liturgy and Holy Saturday. That too, is a moving experience but has a different intention … watching and praying with Jesus in the Garden of Gethsemane. We move immediately into the Gloria in Excelsis and the service proceeds with our usual joyful celebration of the Easter liturgy, complete with wonderful hymns. I hope you will join with your Christian family throughout the world who, will be living fully into the sacred days of Holy Week of which the Vigil and Easter Day is the culmination. There is something powerful about starting in the place of desolation where we left our Lord in the garden tomb and returning there again with the women who found our Lord risen. May it be so too in our lives and in the life of our world. Keep the Faith and let the Faith keep you. The Easter Vigil is one of the oldest services in the history of Church. It begins in darkness with the kindling of a new fire, the chanting of the Exsultet, a series of readings from the Old Testament to remind the faithful of God’s past victories, continues with the renewal of our baptismal covenant and then shifts dramatically to the joyful first Alleluia’s of Easter when Christ reigns victorious over death and the grave. Easter Day is the annual Feast of the Resurrection. Faith in Jesus’ resurrection on the Sunday (or third day) following his crucifixion is at the heart of Christian belief. Join us for this joyful day of celebration. Alleluia! Christ is risen! Altar Guild members and all other church members are needed to help make crosses for Palm Sunday. Join us at 9:00 am in the Parish House on Saturday, April 13 for an hour of fellowship. On Sunday, April 14, the Youth Sunday School Class will be in the Parish House making soft pretzels, which will be enjoyed by those attending Coffee Hour following the 10:45 am service. The pretzel has a deep spiritual meaning for Lent. The first pretzel was made by an Italian monk who wanted to provide a simple reminder that lent is a time of prayer. He made the bread dough with only flour, water, and salt since early Christians ate no dairy products during lent. The little breads were called bracellae, the Latin word for “little arms” because the dough was shaped like two arms folded in prayer. From this word came the German word bretzel, and our word pretzel. The tradition at the 9:00 am Easter Eucharist is to flower a cross and, at the end of the service, process with it to the cemetery. 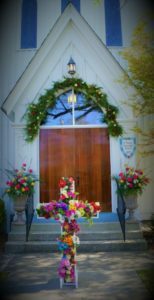 Parishioners are asked to bring flowers to the church and place them on the cross (outside near the front door) prior to the service. Bring enough flowers for yourself and some to share. Sunday, May 5 at 5pm, Schola Cantorum of the Diocese of East Carolina will offer Choral Evensong in the sanctuary of St. Paul’s. Schola Cantorum, the auditioned choir of the Diocese of East Carolina, travels throughout the diocese and beyond to keep alive the Anglican tradition of Evensong – a fully sung evening prayer service. The majority of the service is sung by the choir and lasts approximately 55 minutes. We hope you will bring a friend to experience an Evensong and to hear some of the most beautiful sacred choral music ever written. This year the ECW of Province IV is having their Annual Retreat & Meeting locally at Trinity Center Monday June 3 – Wednesday June 5. Province IV, also known as the Province of Sewanee, is the largest of the Provinces in The Episcopal Church and is comprised of twenty dioceses in nine Southeastern states. Chris Butterworth will be speaking on the ECW Province IV theme, Godly Harmony, Transformation & Renewal In Today’s World. Commuters pay $15 per day for lunch and a registration fee of $50 which must be received by May 8. Information and a registration form are posted in the Parish House and available in the office. The ECW values its students and all the work they do for St. Paul’s. If you are a graduating high school senior, a member of St. Paul’s, and planning to continue your education we invite you to apply for a $1000.00 Patti Dill ECW scholarship to help with your education. The application is in the Church office. Please complete and return it no later than May 1, 2019. If you have any questions, please contact Tricia Phillips at 252-241-6363 or cjp101445@gmail.com. St. Paul’s is among the 14 host churches providing housing, one week at a time, for homeless women and children from across the county. The program, which operates at 1500 Arendell St. in Morehead City, provides job training and child rearing skills while helping the families find homes. Volunteers are needed to set up and break down sleeping spaces, prepare and serve meals, spend the night and set up breakfast daily, provide children’s activities and arrange transportation to and from the center. For more information contact Sarah Jo Safrit, outreach commission chair, at sarahjows66@gmail.com. To make a monetary contribution to this cause, you may use an outreach envelope (found at the back of the church) or simply drop your check in the plate during the service. Please make checks payable to St. Paul’s Church and write “outreach” in the memo line. Checks may also be mailed to the church or give online at www.stpaulsbeaufort.org. To add your name or the name of a loved one to the prayer list, contact the St. Paul’s Office at 728-3324 or email church@stpaulsbeaufort.org, Individuals will remain on the prayer list for three weeks. To keep the person on the list longer, simply contact the Office with that request at the end of three weeks, doing so as long as needed. The person to be listed must give permission for their name to be included in this public prayer request list. This is to protect their privacy and respect their wishes. Go to www.stpaulsbeaufort.org to check out upcoming events, catch up on The Epistle, and make donations online.